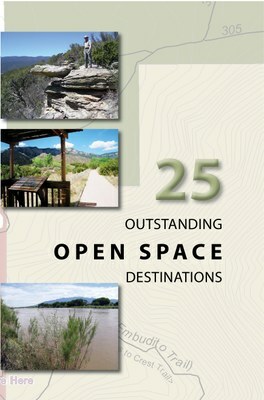 This unique trail and destinations guide was produced by the Open Space Division in 2009 during our 25th Anniversary year. The guide features Open Space trails, trivia and more, and is available through the Open Space Alliance for $5.00. All sales benefit the Open Space Alliance. Open Space Division staff and volunteers have completed a 2nd edition! Many thanks to Open Space volunteer Charlie Wood for visiting each of the destinations and submitting the following comments for the newest version of the booklet. If you own the 1st edition, you may use these corrections to enhance your use of the booklet. The trail is 1.25 miles rather than 0.5 miles. The Community Farm is at the NW corner of the property, 1-mile from the parking lot. The fishing pier is not on the river -- it's on the ditch east of the river and parking area. The Pino Trail continues over 3 miles and terminates at the Crest Trail. The trail loop is 5 to 8.5 miles. Take I-40 to the Tramway exit (Exit 167). Go north on Tramway. At the first traffic light, turn right on Encantado, Follow Encantado for .5 miles and turn right on Oakwood Pl. Drive .1 mile and turn left on Hilldale for .1 mile. Turn right on Camino de la Sierra for .4 mile to the trailhead of 365. Park on east side of the road. Go about 2.5 miles until you reach an Open Space Boundary sign and horse-gate on the left side. It is 3.2 miles, not 6 3/4 miles to the village of Cedar Crest. Take I-25 to Placitas (Exit 242). Turn right and take Highway 165for 6.7 miles turn left. Follow Palomino .6 miles until the pavement ends. Turn left (sharp left) for .2 miles, follow it through an opening in the fence where it will take another sharp left. Continue for .1 miles until you see the Open Space sign.